A staple of any woman’s bedroom in the 1950s was a vanity. A place to store their jewelry, make-up and prep themselves for the day. Over the decades the vanity has disappeared, replaced by the bathroom. For me, it was something I always wanted – I wanted to be that pin-up seated at her vanity putting on her lipstick. So when I saw this Hey-Wake vanity on CraigsList a few years ago for $125, I had to have it. With a little elbow grease, I was able to refinish the top of the vanity and remove the rings on top. I had my upholstery guy, Joe Klem (UPDATE: Sadly, Joe passed away in January, 2012), reupholster the stool and tada! A vanity to call my own! I use the top portion of the vanity to store my headbands. The sides of the vanity are flanked by Guy Williams images. I don’t have my ears pierced, thus I have become addicted to clip-on earrings, and I adore these swirly earring racks. The photo on the left is of my grandfather. He died in the late 60s, and has become kind of a legend in our family among those who are his grandkids. A WWII vet, he raced jalopies and gave my father a classic 1950s childhood in California. Train cases are another thing of the past that I adore. I have a total of four, including this one that I use for jewelry. I adore the look of so many ashtrays, but I don’t smoke, but have found use in them ranging from coasters to jewelry trays. Errand Running Turned Shopping Trip	Play it now, play it now! This is lovely! I love seeing the furniture you’ve restored. Adore that! I remember my grandmother’s vanity with such fondness. It had the three mirrors that you could move around. I was fascinated with being able to see the back of my head! Perfection! I love vintage vanities. I own one from the 1920s and another more recent one. I want to buy one from the 40 or 50’s soon to put in my other guest room. Your vanity is super stunning and I love how you decorated it with your everyday vintage items. Thank you! I am planning on doing an updated entry of this, things have changed a bit. I was reading some of your past posts and came across this one, I had to write and just say how gorgeous your vanity is. I have been on the hunt for a heywood Wakefield bedroom set for a while….I would love to see your updated changes as you stated. Do you also have the full bedroom set of the Wakefield furniture? 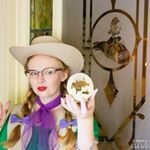 I also just wanted to add, the posting you did of your quilted stagecoach circle skirt has got to be my favorite outfit of yours, you just captured the 50s perfectly in that outfit! Just lovely! Would you mind me asking what type of camera you use for your posts, your pictures come out so beautifully. Thank you! I really have been meaning to do a redo of this, but so many other projects keep getting in the way! With regards to our bedroom, we don’t have a “full” set. We have a high boy dresser, the vanity, a pair of nightstands (although one is in the bedroom and the other in entry hall), and a bookcase. So no bed. One day! My dad’s bedroom though is a full set, including bed, nightstands, high boy dress as well as a low dresser. I shoot with a Nikon D90.